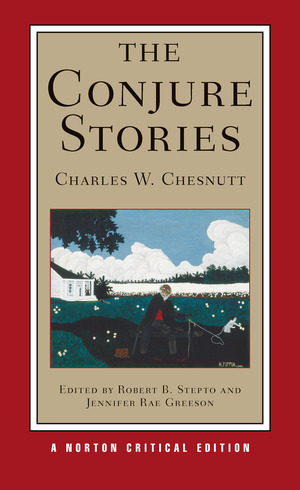 This Norton Critical Edition of The Conjure Stories arranges the tales chronologically by composition date, allowing readers to discern how Chesnutt experimented with plots and characters and with the idea of the conjure story over time. With one exception, the text of each tale is that of the original publication. (The text of “The Dumb Witness” was established from two typescripts held at the archives of Fisk University.) The stories are accompanied by a thorough and thought-provoking introduction, detailed explanatory annotations, and illustrative materials. “Contexts” presents a wealth of materials chosen by the editors to enrich the reader’s understanding of these canonical stories, including a map of the landscape of the conjure tales, Chesnutt’s journal entry as he began writing fiction of the South, as well as writings by Chesnutt, William Wells Brown, and Paul Laurence Dunbar, among others, on the stories’ central motifs—folklore, superstition, voodoo, race, and social identity in the South following the Civil War. “Criticism” is divided into two parts. “Early Criticism” collects critical notices for The Conjure Woman that suggest the volume’s initial reception, assessments by William Dean Howells and Benjamin Brawley, and a biographical excerpt by the author’s daughter, Helen Chesnutt. “Modern Criticism” demonstrates rich and enduring interest in The Conjure Stories with ten important essays by Robert Hemenway, William L. Andrews, Robert B. Stepto, John Edgar Wideman, Werner Sollors, Houston A. Baker, Eric J. Sundquist, Richard H. Brodhead, Candace J. Waid, and Glenda Carpio. A Chronology of Chesnutt’s life and work and a Selected Bibliography are also included.